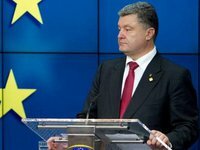 Ukrainian President Petro Poroshenko plans to discuss the Ukraine-EU power interconnection project with leaders of the European Union (EU). "The day after tomorrow [March 20] in Brussels, I will speak about this with the leadership of the European Commission, President of the European Commission, President of the European Council, and the European Commissioner," Poroshenko said at a meeting on the development of nuclear energy and improving safety in using nuclear energy on Monday in Netishyn (Khmelnytsky region). He said that the implementation of this project will not only ensure an increase in electricity exports from Ukraine, but will also allow attracting funds for the construction of new power units. "This meets the strategic interests of Ukraine and the vision of the future development of energy, as well as the energy security of our partners – the EU countries. Not to build gas pipelines from Russia to be on the gas "needle," but to cooperate in the field of nuclear energy with Ukraine. I declare the power bridge project is a geopolitical counterbalance to the plans of Moscow, which will allow our European partners to have an alternative, reliable source of electricity supply at competitive prices. In other words, Ukraine may become an important contributor to Europe's energy security," the president said. According to the head of state, in the long term this project will provide an opportunity of integrating the united power grid of Ukraine with the European network.